Home › Health › Health insurance companies deny too many claims. 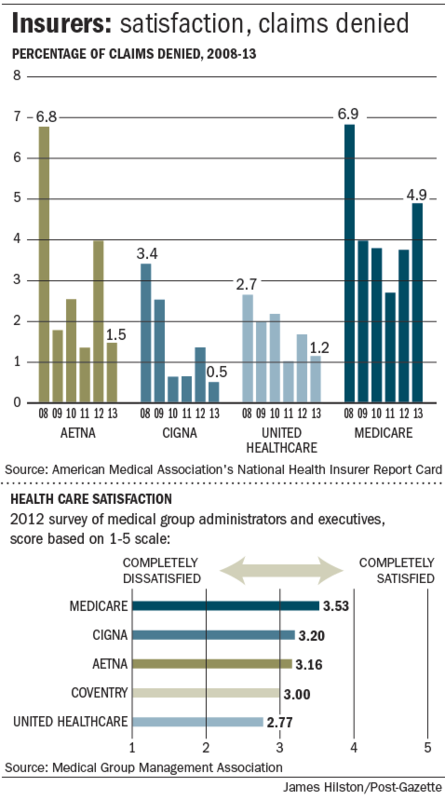 Health insurance companies deny too many claims. Health insurance companies deny claims because they are trying to save themselves the money, but this just increases overall costs because it increases administrative costs for the providers and the patients who have to sort out how to get payments. Somebody has to pay so it doesn’t really reduce costs to just capriciously reject claims. It just increases costs for someone else. Atul Gawande claimed that “insurers find a reason to reject payment in up to 30% of the bills they receive… A well-run office can get the insurer’s rejection rate down from 30 percent to, say, 15 percent. That’s how a doctor makes money. … It’s a war with insurance, every step of the way.” (Gawande, 2008, pp118-120). David Cutler gives a dramatic example of how this drives administrative costs in the US: “Duke University Hospital, …one of the finest hospitals in the nation… has 900 beds and 1300 billing clerks.” In Canada, hospitals spend less than a quarter as much on administration compared with US hospitals because one insurance company pays for almost all the hospital bills. Canadian doctors are more sure about what claims might be rejected and which ones won’t because they mostly deal with a single payer, so they are less likely to submit claims that the insurance company will find dubious. California health insurers reject [over] 1 in 5 medical claims. Six of the state’s largest insurers rejected 45.7 million claims for medical care, or 22% of all claims, from 2002 to June 30, 2009, according to the California Nurses Assn.’s analysis of data submitted to regulators by the companies. …said Nicole Kasabian Evans, spokeswoman for the California Assn. of Health Plans. “It appears that a good deal of the so-called denials are merely paperwork issues,” she said. Brown’s office said that his deputies would soon review records and complaints. “These high denial rates suggest a system that is dysfunctional, and the public is entitled to know whether wrongful business practices are involved,” Brown said. Doctors complain that too often insurers delay, shortchange or deny legitimate claims. “Getting health insurers to pay their fair share of medical claims can be as much of a headache for physicians as it is for patients,” said Rebecca Patchin, an anesthesiologist at Loma Linda University and board chairwoman of the American Medical Assn. She said each insurer has a different set of “obscure, bureaucratic rules for processing and paying medical claims” that result in as much as $210 billion of “unnecessary cost” annually, studies have shown. American Academy of Family Physicians (AAFP) estimated between five and ten percent. A 2011 Government Accountability Office (GAO) study estimated up to 25 percent. The American Medical Association (AMA) has been publishing annual estimates for several years and generally finds that it is somewhere under 5 percent. ‹ Wacky healthcare prices in America.